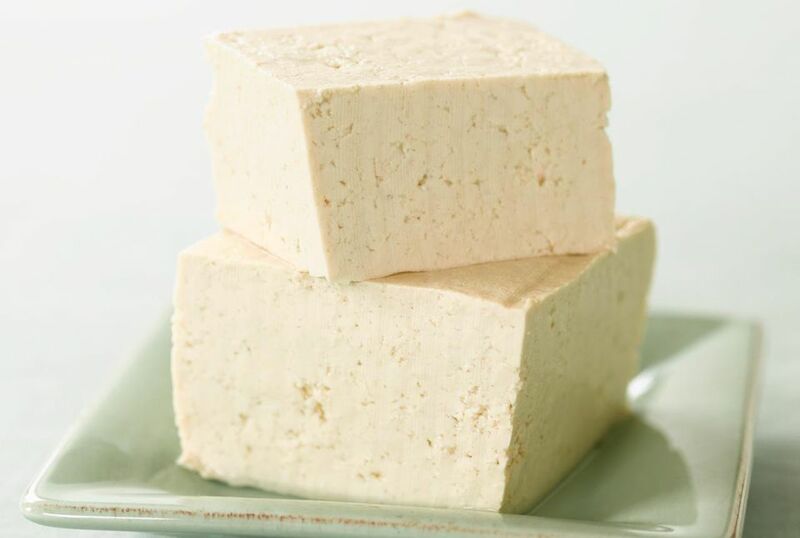 Tofu is a vegetarian protein substitute that can be firm in texture or creamy. Its health benefits are numerous, and the ways you can prepare it are innumerable. You will need 1 package of medium to firm tofu ("soft" tends to fall apart). Be sure to check the expiry date. Tofu does expire - you'll know it's gone bad if there's a smell. Fresh tofu has virtually no smell. Look for tofu that contains calcium for added health benefits. It's always a good idea to buy organic if at all possible, as soybean crops are heavily treated with pesticides. Storing Tip: Once opened, store any unused tofu in a covered container. Place tofu inside the container, then fill it with water (so that the water is covering the tofu). Cover tightly. Try to drain and replace the water on alternate days until eaten. If you've bought pressed tofu, you can skip this step and the next. Otherwise, open the package and drain out all the water. Place the drained block of tofu in a flat-bottomed bowl. Cover the tofu with a paper towel (fold it into the size of your tofu). Then place a bowl or another heavy object on top. After 5 to 10 minutes, remove the weight and throw away the wet paper towel. Drain off the water that has been pressed out of the tofu and lightly pat dry. Place pressed tofu on a cutting board. Slice the block into approximately 1-inch cubes. Set aside. Make a Flour and Sesame Seed Mixture. For this recipe, you will also need approximately 1 cup canola or other vegetable oil for frying. Roll the Tofu Cubes in the Flour/Sesame Mixture. Roll the tofu cubes in the bowl containing the flour/sesame mixture until well covered. Pour 1/2 to 1 cup canola or other high-heat oil into a wok or small frying pan. You want the oil to be about 1 inch deep (if using a large pan, you may need more oil). You will also need tongs and some absorbent towels (or paper towel). Place pan over medium-high heat. To test if your oil is hot enough, using tongs, dip a corner of a tofu cube into the oil. If it begins to sizzle and cook, the oil is ready. When oil is ready, place cubes of floured tofu in the pan. Turn heat down slightly and fry the tofu. Using tongs, turn the tofu cubes after 1 minute. Cook until cubes are a light golden brown. Drain the Tofu on an Absorbant Cloth or Paper Towel. When tofu is a light golden brown on all sides, remove from the oil and place on a paper towel or absorbent cloth to drain and cool. Enjoy the fried tofu while still hot. The outside will be crunchy, while the inside should be soft. Serve it with sweet Thai chili sauce (pictured here), available at most grocery stores, or with Thai Peanut Sauce/Dip. Serve the peanut sauce warm or at room temperature.